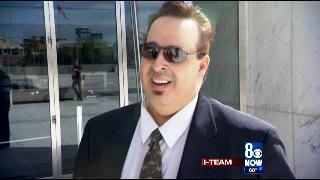 LAS VEGAS - The largest political corruption case in southern Nevada came to an end Friday with the re-sentencing of the ringleader. The scheme focused of seizing control of local homeowner associations and involved dozens of co-conspirators including lawyers, retired police officers, and others. Forty defendants were sentenced. Most of them pleaded guilty, Leon Benzer, the ringleader, was the last to be sentenced, and in the front row of the courtroom Friday were the two investigators who started the ball rolling -- a Metro detective and a former FBI agent. They wanted to be there for the end. Leon Benzer doesn't look like an organized crime boss, but he was the principal target of Operation Mastermind, the name given to the multi-agency investigation that began 11 years ago. The Benzer who appeared in federal court Friday morning is a changed man, his hair now thin and gray after spending the last three years in prison awaiting re-sentencing. As the I-Team first reported a decade ago, Benzer's ambitious scheme involved devious plots to take over the management of nearly a dozen homeowner associations, including Vistana, one of the largest. Elections were rigged, thugs were hired to intimidate residents, and once an HOA was under Benzer's control, lucrative construction defects lawsuits were filed, but millions of dollars in settlements went to Benzer's criminal organization, which included several well-known attorneys, at least four former police officers, and dozens of others, some of whom had strong political connections. A total of 40 people were convicted or pleaded guilty. Four suspects committed suicide before trial, including prominent attorney Nancy Quon, who specialized in construction defects lawsuits. Benzer pleaded guilty in 2015 but appealed his sentence. Friday, federal Judge James Mahan heard a sobbing Benzer apologize for his misdeeds and heard an emotional plea on video from Benzer's struggling wife and children, but prosecutors reminded the court of the thousands of homeowners who were victimized, many of them frail, elderly, and now destitute. Benzer will have to serve 12 more years in prison and is responsible for millions of dollars in restitution, money that likely will never be repaid. As big as this was -- with 40 defendants -- the reality is there were dozens of others who could have been charged but weren't, including public officials. It's unknown if those names will ever be made public. Though at this point it is too late to press charges.